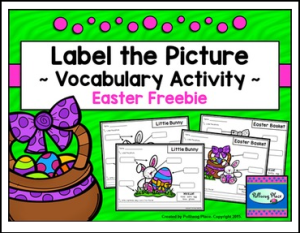 This Label the Picture free sample set contains 2 printable picture labeling pages that focus on building vocabulary and writing skills. Each page has a fun picture, a word list, and boxes for labeling parts of the picture. There is also a place for students to write a sentence using one of the words from the word list. Label the Picture activity pages are an engaging way to build vocabulary and writing skills. They are great for centers, early finisher activities, reviews, and more! These Label the Picture activity pages come in two color options. There are 2 full color pages, and 2 black line pages to save ink. The color pages can be laminated or placed in a plastic sheet protector to use with a dry erase marker. If you like this sample set, please see my larger set of Label the Picture Vocabulary Activity Pages. Look for more learning resources in my TPT store.